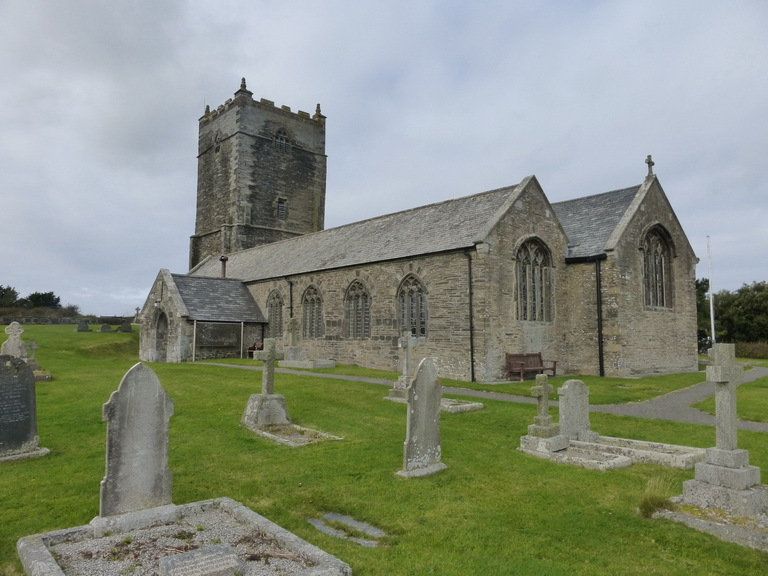 The church of St Merryn stands proudly on the edge of the village. The first impression is of the unusual proportions of the tower which appears to have a stubby top section, rather as though the builders put the upper string course in the wrong place or lost the ambition to make it taller. The history of the tower bears study for the first stage is topped by four shield-holding angels where the stonework also changes. We were fortunate to find an organist practising away with the lights on. This, the lack of Victorian stained glass and the white-painted plaster, helped to make the church light and welcoming. The unplastered east ends made an interesting contrast. The most outstanding thing is the use of catacleuse (cataclews) stone which is quarried nearby. When polished it produces a smooth finish almost akin to serpentine. This is used to good effect in the pillars and font. The font is a joy. Originally in a now lost chapel of St Constantine in the parish, it was moved into the church in 1845 when the original, no less splendid one, was moved to Maker church. What an embarrassment of riches. 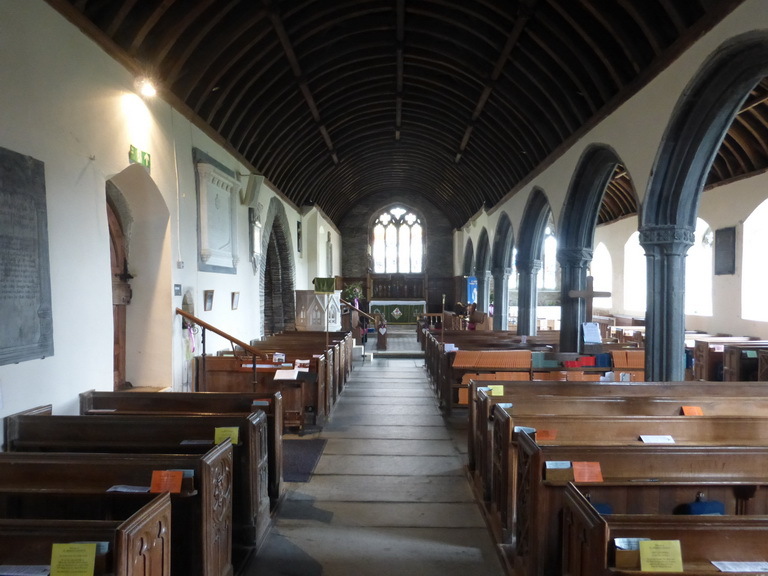 Our attention was drawn to some fairly damaged monuments, one C17 in slate, the wagon roofs – with the south aisle one being the better – and the attempt to re-use part of some bench-ends in modern seating. Pevsner also refers to some excellent C20 typography in the south aisle windows. This just worked for us but was weakened by the light outside which made it difficult to read. 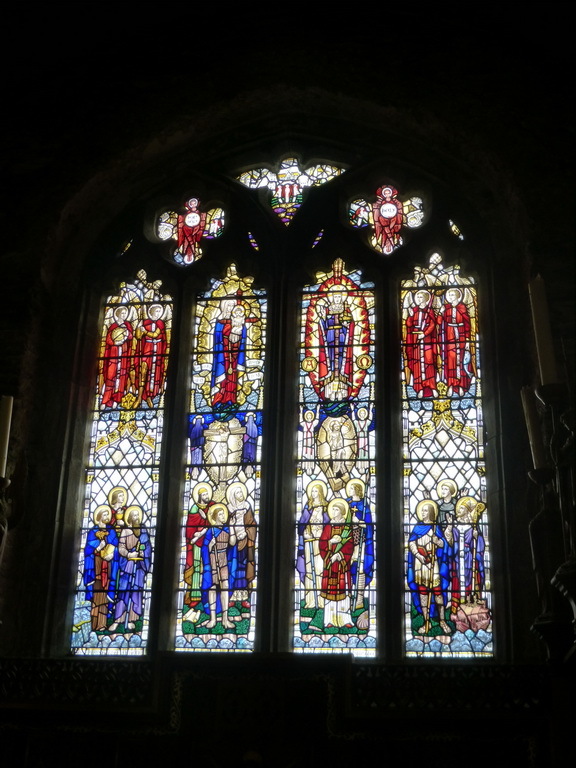 More striking was the east window which used strong primary colours and plain glass very effectively to good effect. There is no indication of its origin.